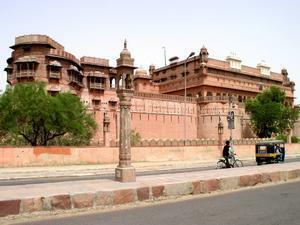 bikaner was founded in the 15th century by Rao Bikaji ,the son of the Rathor raja of Marwar. Spurred by the blessing of a great femalemystic,Karni Mata,whom he had met along the way and who had predicted that his fame and glory would someday exceed that of his father, Rao Bika fought the local desert clans for thirty years. This desert city was a major trade center on the old caravan route linking central Asia and North India with the Gujarat sea ports long before a Rathor Prince, Bika, conquered it in 1486 A.D. and called it bikaner. The Beautiful places to see in bikaner are the Junagarh Fort, the Government Camel Breeding Farm, Bhandeshwar Jain Temple, Deshnok Karni Mata Temple, Ganga Golden Jubilee Museum, Kolyat Ji , Bhaironji Temple Kodamdesar , Devi Kund and the Lalgarh Palace.